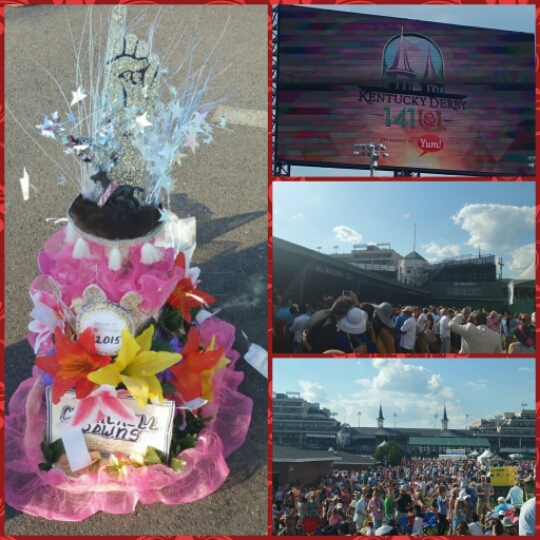 There was no better way to celebrate my completion of the Kentucky Derby Festival Marathon than by attending the two main events in which the marathon is named after. 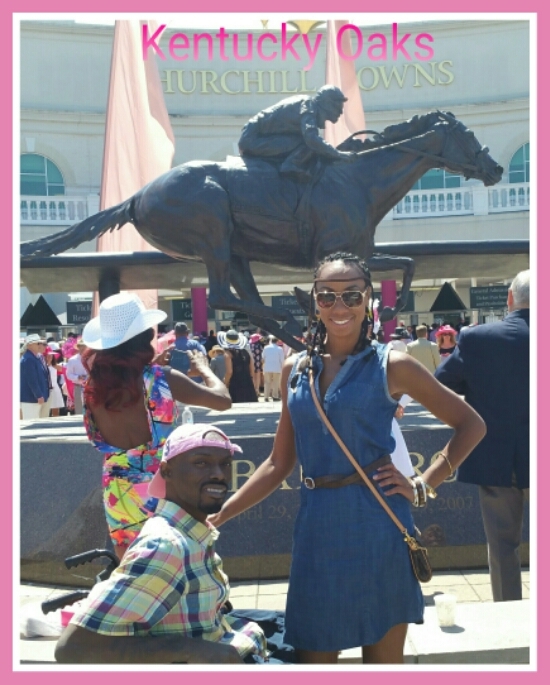 I have lived in Kentucky for 9 years and never visited Churchill Downs for the Oaks or Derby races. All that would change this year, although I did not have any tickets. 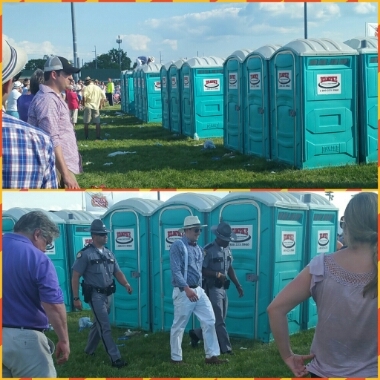 I did some research and found a lot of useful information from http://trippingblonde.com/a-guide-to-buying-tickets-to-the-kentucky-derby/. We parked at the Kentucky Expo Center and caught a shuttle to Churchill Downs. The traffic was not as bad I expected. The shuttle drop off is at Gate 1. 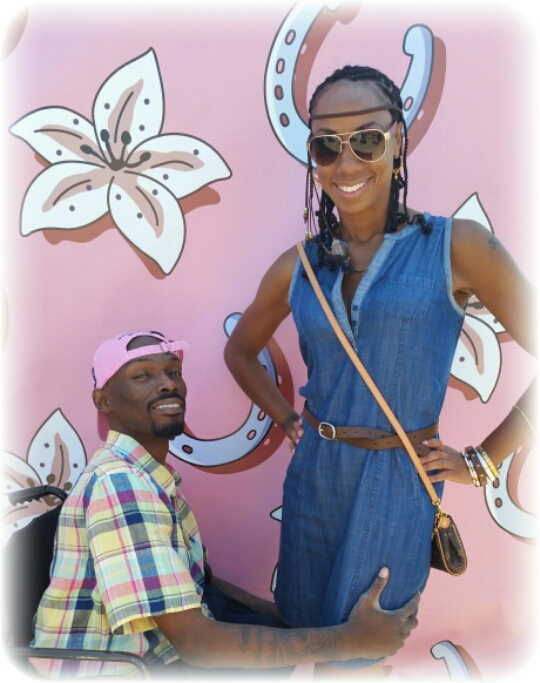 This is a great photo opp, and event staff were more than happy to assist. The tickets for general admission are sold across from Gate 3 which worked out nicely since it is the only entrance which allows chairs. I had a Disney World flashback as I stood in line for 30 minutes. At that moment, I was thankful for my comfy cowgirl boots. Some women were struggling in heels on the gravel walkways. The time went by quickly because I was talking with people and taking in all the scenery. The excitement was in the air, and I was thrilled to be in the midst of it. 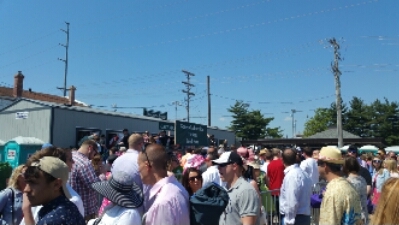 A lady described Oaks as a day for locals and Derby as being more for the out of towners. I think it’s a combination of both because tickets purchased directly from Churchill Downs in the fall prior are good for both days. I could have avoided the general admission line if I had remembered to purchase online before 5 p.m. the day before. We walked past the “Fear God” shouting people to the security check. Yelling at people about them going to hell is not a good way to win souls. Security check was an easy process, and I recalled Gate 3 being the exit of the infield loop for the marathon. We walked through the tunnel to the infield and it was a relief to be there and soak in everything. We set up chairs next to a group from New York. They agreed to watch our stuff as we took a stroll to make sure we didn’t miss anything. Attending Oaks was so easy and not as complicated or chaotic as people make it out to be. I don’t understand why more locals do not attend. Maybe they don’t like crowds or prefer the backyard cook outs. Not me. I like being in the mix. Another observation is how the television broadcasts make it seem so pretentious and perhaps the general public feel as if they do not belong. Again, not me! I saw people wearing everything from stilletos to Jordans and jeans to seer suckers. The most important factor is being comfortable. Don’t forget the sunscreen! My shoulders and nose got burned. I didn’t bet on any horses. It has been a while since I was on Millionaire’s Row for my birthday that I had forgotten the lingo. I’m not much of a gambler anyway. I went against the grain and didn’t wear a drop of pink. That was totally ironic considering pink is my favorite color. 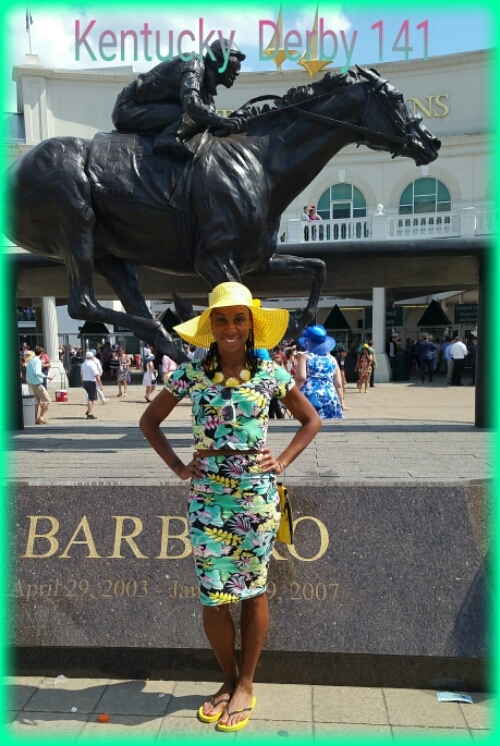 The Lily photo backdrop made up for my fashion faux pas on the pink suggested Oaks day. I couldn’t tell you who won the 3 year old fillie thoroughbred race. I can tell you I had such a good time in the record breaking, almost 140,000 crowd that my heart told me to go back for Derby. I put this outfit together in 5 minutes starting with the hat. I wanted to compare the infield atmosphere between both events. There was a strong desire to party on the infield in beautiful weather which was opposite of what I ran in one week prior. Something told me to seize the moment. I knew the process, so I headed out solo dolo. As I was waiting in line again for general admission tickets, I met a lot of cool people from Kansas, St . Louis, Chicago, and Ohio. The vibe was a little more turned up and the fashion was a little dressier. I arrived around 3 p.m. and went to the betting window. I waited in line another 30-45 minutes which went by quickly from talking with people about their picks. The 3rd turn is the livest of the live. A DJ was set up and giving out freebies. This man was cheered on as he attemped a porta porty marathon. Unfortunately, he didn’t win a medal for his playful act. 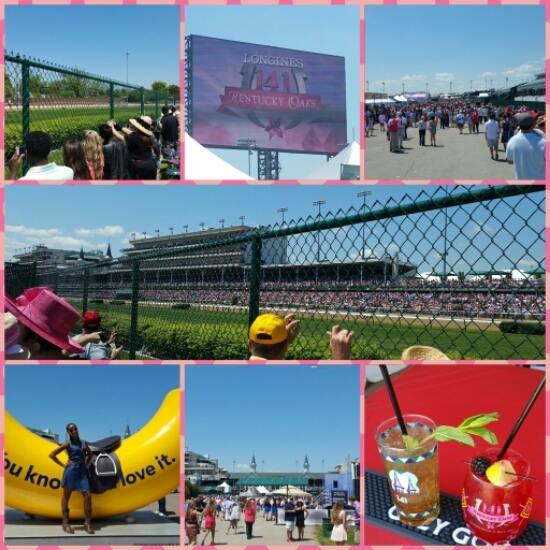 Derby infield party zone- 3rd turn. Back on the 1st turn, it was packed with a more family, picnic type of vibe. The tunnels provide access to the Paddock, but I knew it would be jam packed, so I only went so far as I devoured a smoked turkey leg. People from the grandstands like walking over to the infield as well. Everyone was on edge watching the Derby race. I made my way to the tunnel entrance to get a jump on another record breaking crowd of 170,000 people. The line for the shuttle going back to the Expo took forever, but it was all worth it. American Pharoah won the Derby but he wasn’t in my trifecta bets. Boo. Next year I would like to sit in the grandstands in a nice club seat with better food. The infield did not offer the best cuisine selections. Overall, I had the most fun this past weekend than I’ve had in a long time. I will always remember May 2, 2015 as one of the most hyped days in sports history with the Kentucky Derby and MayPac fight. Step out your comfort zone! 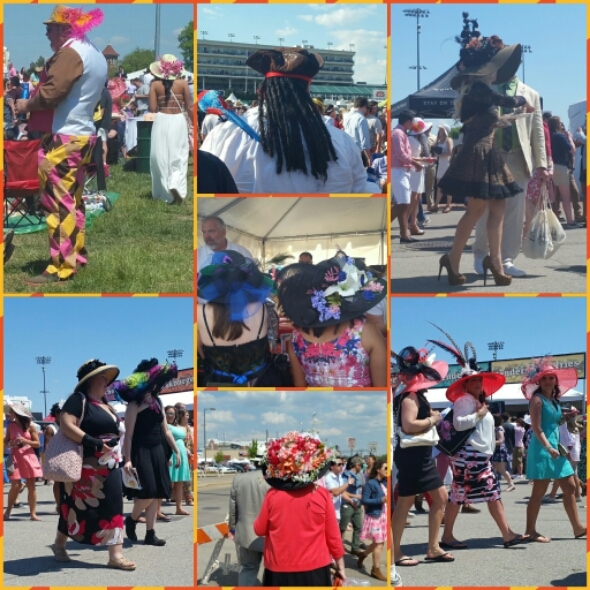 This entry was posted in Louisville, Travel and tagged Churchill Downs, derby hats, Infield, Kentucky Derby, Kentucky Oaks. Bookmark the permalink. What a cool experience. I was in KY once when the derby was going on. Thought about trying to get in, but opted to watch it from a pub instead. Looks like you had a blast! Hey Scott! You gotta come back and get in on the infield action! 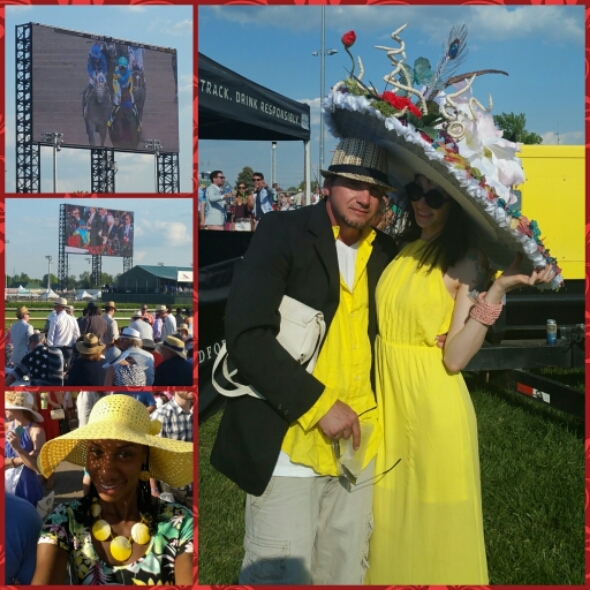 That’s so cool that you got to see the Kentucky Derby! I’ve never watched a horse race. Looks like fun! That sounds like a lot of fun. 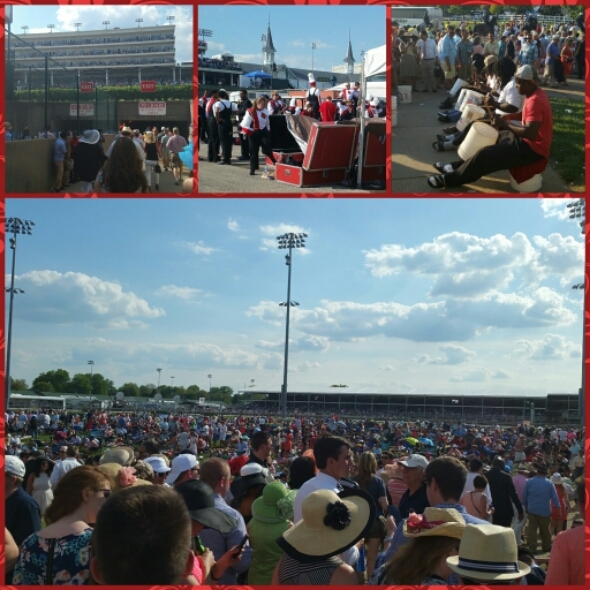 I am usually out of town during Derby…but not this year. I’ve done the Millionaire’s Row thing a couple times and it’s fun. Never the infield. What a great weekend. Did you have a Lily? That’s the best drink at Churchill Downs! Yes, I tried the Lily and loved it. They ran out of 141 glasses on Derby and were giving out 140 and 139 glasses for lily and mint juleps.